Sunshine and clouds mixed. Slight chance of a rain shower. High 72F. Winds N at 15 to 25 mph..
For Misty's, the time was right for expansion, especially when the right location for the right price became available. "We've been looking to expand again," said Chad Carlson, who co-owns the Misty's restaurants with executive chef Reese Hummel. "We've always been looking at south Lincoln, but we couldn't find a place that was cost effective. We finally found a great opportunity at this building. It was too good to pass up." Misty's opened its third location in Lincoln on Nov. 21 in Williamsburg at 3930 Village Drive, just off of 40th Street and Old Cheney Road. The building formerly was home to a series of Chinese restaurants. It originally opened as Austin's Steak & Saloon in December 1994. Misty's, of course, has a long history in Lincoln. Bob and Grace Milton opened the legendary steakhouse as a "bottle shop" in 1963 as Club 63 in Havelock. In 1965, when the city approved the sale of liquor by the drink, the bottle club became the first Misty's. The Milton family also ran a south Lincoln Misty's in the Edgewood Shopping Center for 20 years (1980-2000). Bob Milton passed away in 1998. Grace Milton gave up the lease to the Edgewood store in 2000 and sold the Havelock restaurant in 2001. New ownership established the second Misty's in 2003 in downtown Lincoln at the corner of 11th and P streets. In opening the new restaurant, Misty's renovated the building from top to bottom. Those who previously dined at the Chinese restaurants will notice night-and-day differences. The biggest change has been in making it more intimate, less cavernous. Misty's built a wall to separate its 150-seat dining room from its 50-seat bar. The dining room is now filled with booths, reminding me of how Lazlo's set up its south location. "We've been open a month now, and I've seen some customers in here four, five and six times already," Carlson said. "The local nighborhood has been quite receptive." Misty's is in my top 10 list for Lincoln and is No. 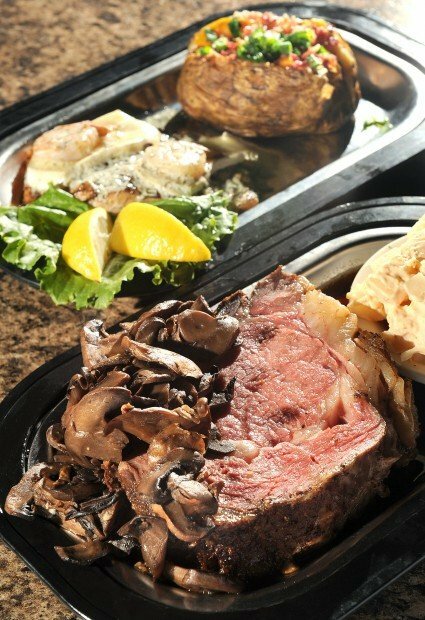 1 for prime rib, which ranges in price from $16 to $30 depending on the size. My father-in-law and I both enjoyed flavorful, 8-ounce cuts ($21.95) cooked medium rare, with the edges seasoned with Misty's trademark seasonings. The prime rib didn't disappoint. While Misty's is known for its red meats, the restaurant is just as accomplished with its seafood selections. My wife thoroughly enjoyed the Salmon Chloe, one of the restaurant's signature items. Cooked medium, the entree ($18.95) was a salmon filet topped with sauteed shrimp and brie cheese and sauced with chardonnay dill butter. My mother-in-law ordered crab cakes ($8.95) off the appetizer menu. Handmade, these were panko-crusted and served with a tangy remoulade sauce. We were tempted by a lobster macaroni and cheese ($19.95), having enjoyed the entree on our trips to Maine. It's a new menu item for Misty's. We will try it on our next visit. We finished with two homemade desserts ($5 each), a peanut butter cheesecake with Reese's Peanut Butter Cups and caramel fudge pecan torte. Mmmmm. My only complaint was no stout beer on tap. I like a bold stout with a steak or prime rib. The espresso porter, however, was a good alternative. It had a wonderful coffee smell and taste to it. To say the new Misty's has been busy is an understatement. With its location convenient to several retirement communities, the steakhouse has become a destination for folks for lunch and dinner. My advice is to secure a reservation, even on weekdays. If you don't, you can expect a wait of 45 minutes or longer during peak times. Full dining rooms, however, haven't meant slow service. My wife, her parents and I dined there on a Friday evening, with our food -- from soups and salads to desserts -- arriving in a timely fashion. I urge you to check out or dine in the bar area. It's filled with booths and tables as well, but the draw is the bar itself, with the granite and stone work done by Lincoln-based companies. In keeping with the sports themes found in the other Misty's, the restaurant has helmets of the Big Ten teams on the walls. High-defintion TVs hang above the bar. Reach Jeff Korbelik at 402-473-7213 or jkorbelik@journalstar.com, or follow him on Twitter at twitter.com/LJSjeffkorbelik.